What is more Australian than a BBQ and Pavlova? I’ve made many (oh so many!) different pavlova recipes from a variety of books and magazines but have found the following works best. Firstly, my recipe has 12 egg whites, it makes a decent sized pavlova. I wouldn’t even bother making a smaller size! Once I’ve added all the caster sugar to the egg whites I let the Kitchen Aid mixer run for a good 10-15 mins, beating the mixture until it’s fairly glossy and firm. Once it’s baked, I turn the oven off and open the door slightly and then leave it until it gets cold in the oven. Most of the time I bake the shell the day or night before and decorate it with cream and fruit the next morning. 1. Pre-heat oven to 150 degrees. 2. Whip egg whites until firm. 3. Add caster sugar a spoonful at a time until it has all been incorporated. 4. Set the Kitchen Aid at a speed of 6 (medium) and leave it! I walk away and check on how it’s going every few minutes. You want the mixture to be thick and glossy. (I’ve walked away and forgotten the mixture many times and have returned each time scared of over-beating, but it has never happened). 5. Pile the mixture onto a baking tray lined with baking paper. 6. Place into oven and after about 10 minutes, lower the temperature to 120 degrees and cook for about 75-90 minutes. 7. I turn oven off after this time and open the oven door a fraction. I leave the pavlova in there until it goes cold (a few hours or overnight). 8. Once cold, I whip the thickened cream until stiff peaks form then add icing sugar. 9. Spread the whipped cream over the pavlova. 10. 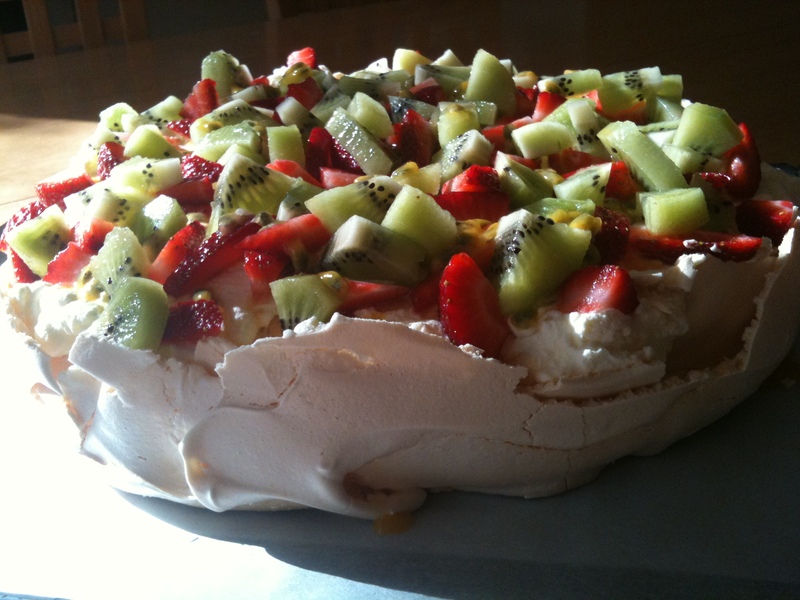 Scatter strawberries and kiwis on top then spoon passion fruit over pavlova. 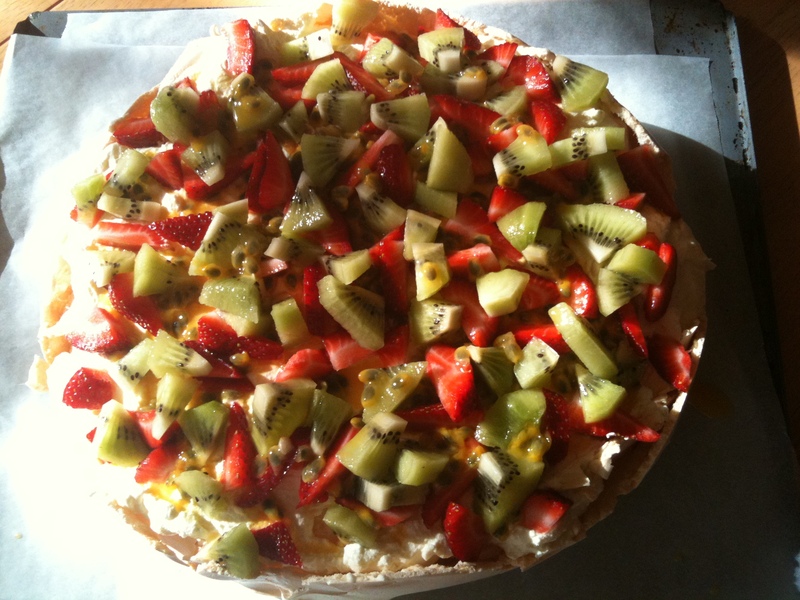 Tags: Australia, Australia Day, baking, cakes, food, pavlova, recipes, tradition | Permalink. Looks lovely! I actually have a niece who is born on Australia Day (something that made her Aussie father very proud). Also, I’ve put you on my list for the Stylish Blogger Award over on my blog. Feel free to participate as much or as little as you like. Wow! This looks scrumptious, I’ve never had pavlova but gorgeous photos like this make me want to make it. I’ve bookmarked this!! I miss Pavlova since leaving Australia, but never seem to manage making it. I need to! Thanks for posting your best recipe!! !